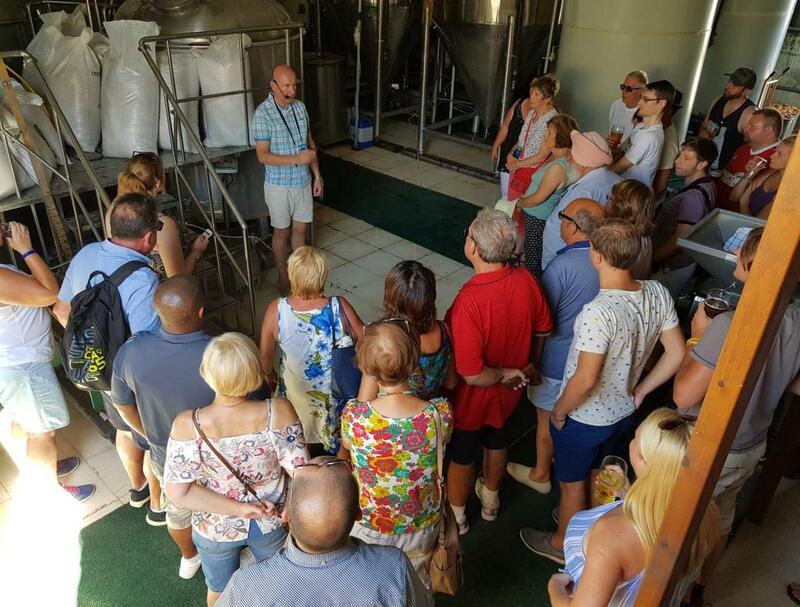 Discover why we routinely rank #1 in Tripadvisor "Things to Do in Paphos"
Don’t leave a visit to the end of your holiday, you’re sure to want to return! 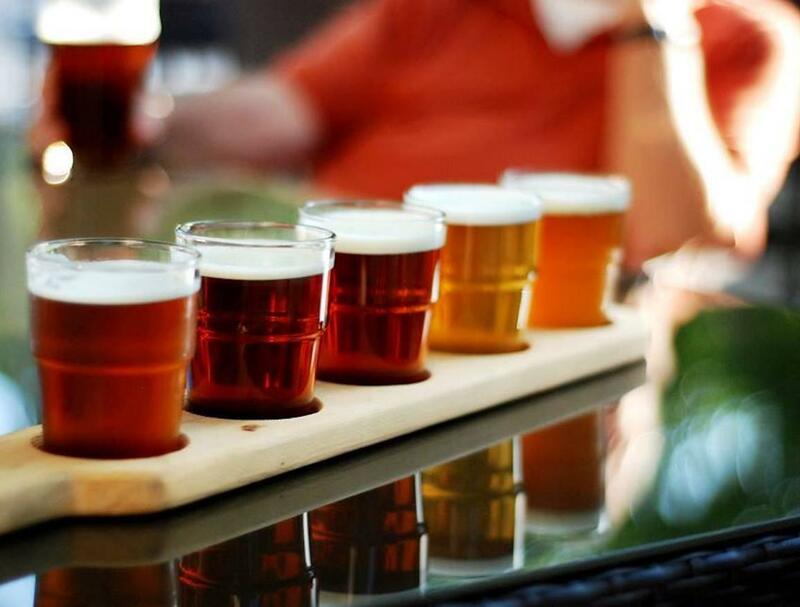 Sip, sup & slurp your way through a generous Tasting Paddle (5 x 200ml Glasses) of international beers or ciders. 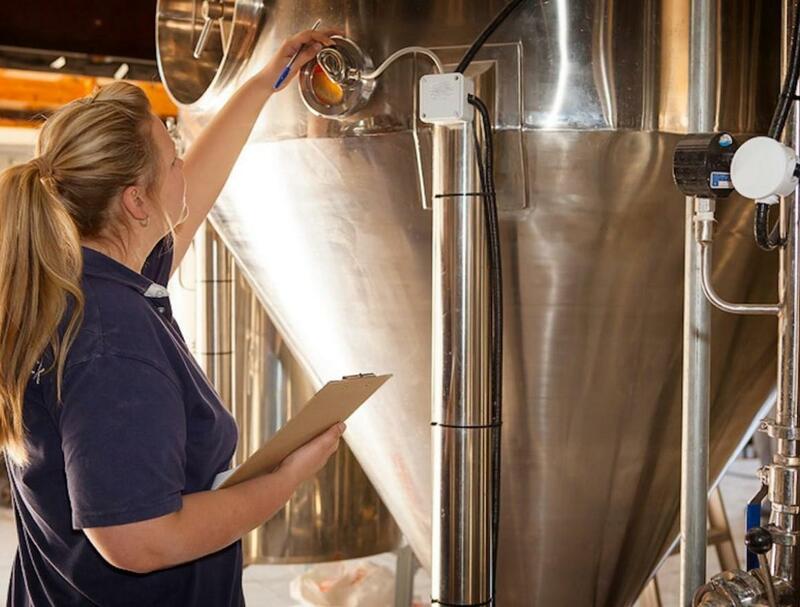 Will your favourite be a freshly brewed German Oktoberfest Bier, a light, easy-drinking Austrian Helles Lager, an intense hop-forward American IPA or perhaps one of our rich & mellow hand-pulled English real ales? "The beer, lager, cider & food is amazing"
"Probably the best trip I have ever been on"
"It's a truly amazing place to visit ... this was the best experience of our holiday"
"The brewery tour is very interesting, informative, entertaining, witty & precise"
"The best pizza I've ever eaten"
"The Best Day Out of Any Holiday, Anywhere!" 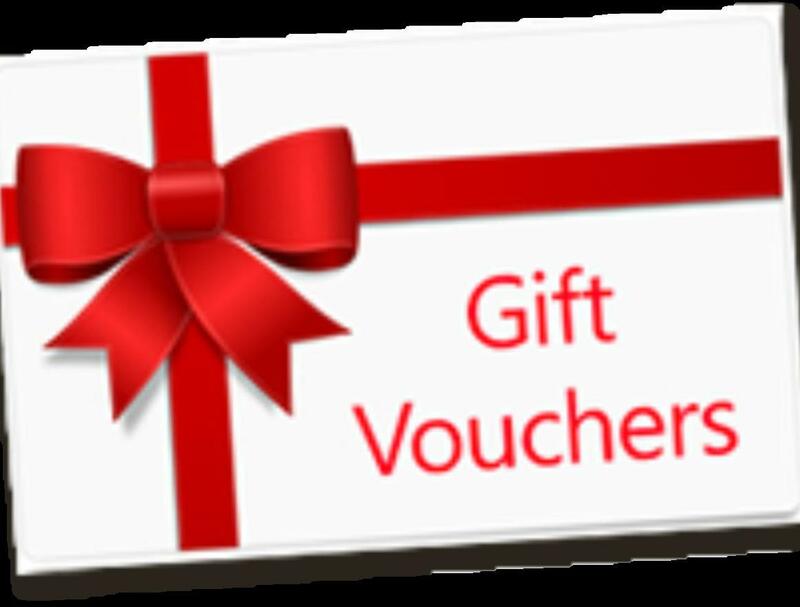 For those oh-so-hard-to-buy-for friends & family members, choose a gift voucher that can be spent on their holiday in Cyprus. 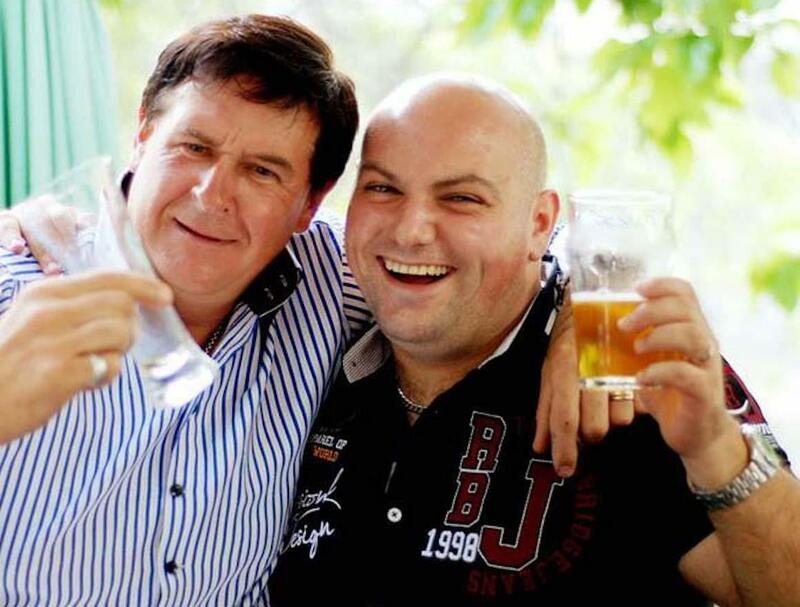 Select one of our packages that include transfers, eg BEER QUEST or PIZZA & PINTS, or a 'Come-By-Yourself' package or just a set value voucher to suit any budget. Just Click SEE MORE to buy your gift. 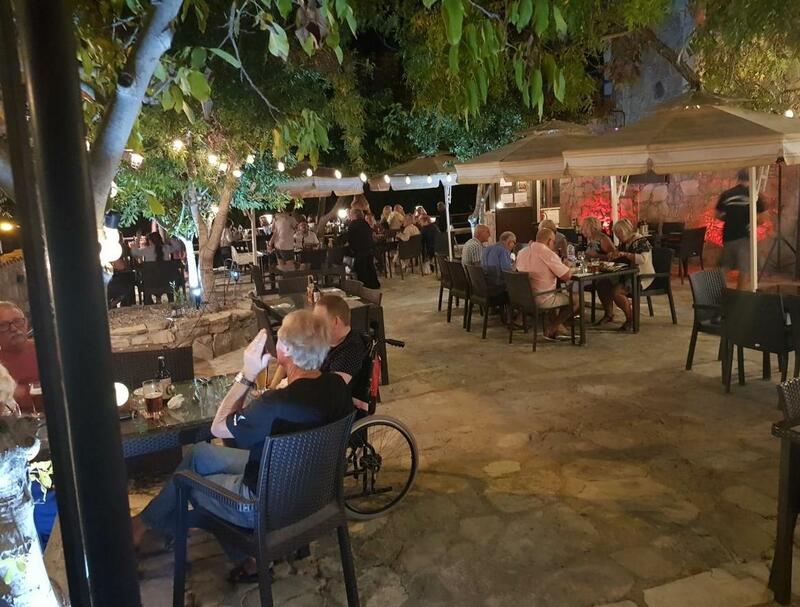 Our unique traditional venue is perfect for any party in Paphos with private service, a dance area and a stage for a band or a DJ. Lush & green through the afternoon it has a magical ambience with great lighting under the stars as darkness falls. Mediterranean memories are made of this. Likened to the Mamma Mia! movie location. Your Fully-Catered Outdoor Party Venue in Paphos. Enjoy Freshly-Brewed Real Ale, Continental Lager & Fruity Cider, etc with Delicious Food, Professional Service and Warm Hospitality in a Perfect Setting. 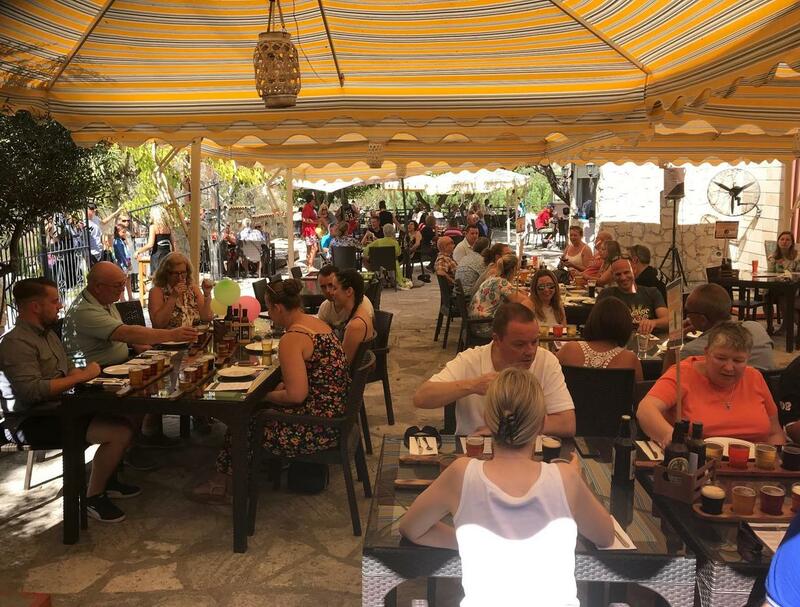 We offer delicious traditional Cyprus meals in Paphos and international dishes cooked with market-fresh mainly locally-sourced ingredients at great prices. 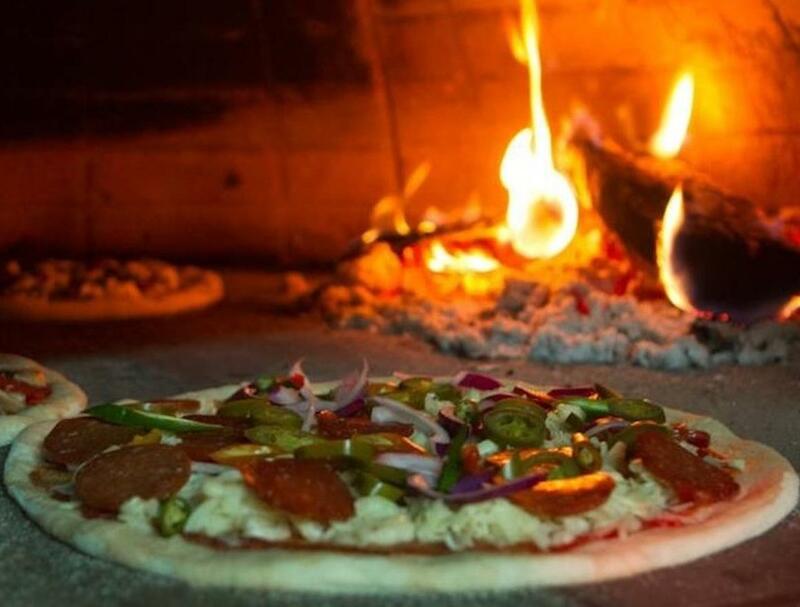 We're also Tripadvisor Best Italian Restaurant in Paphos. 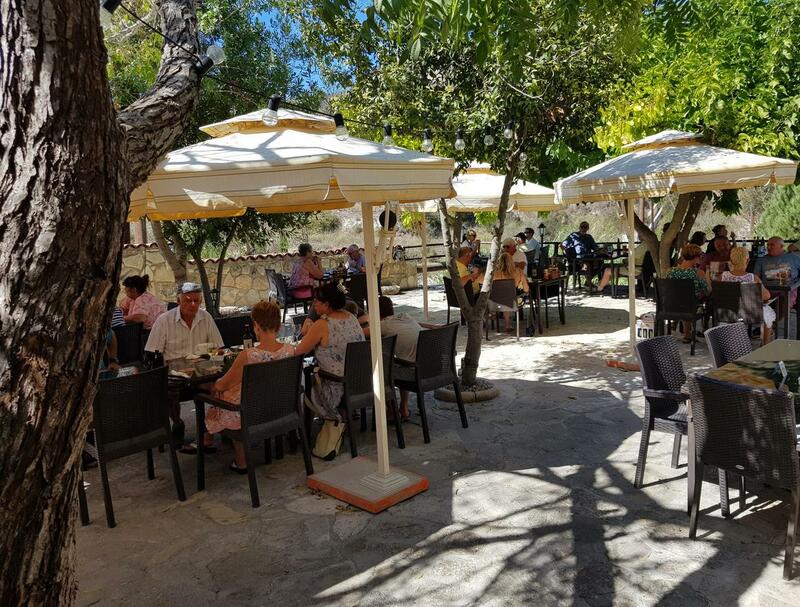 Wondering where to go in Paphos or what to do in Paphos and don’t want the Paphos beaches again then come to us for a fun day out in Paphos. 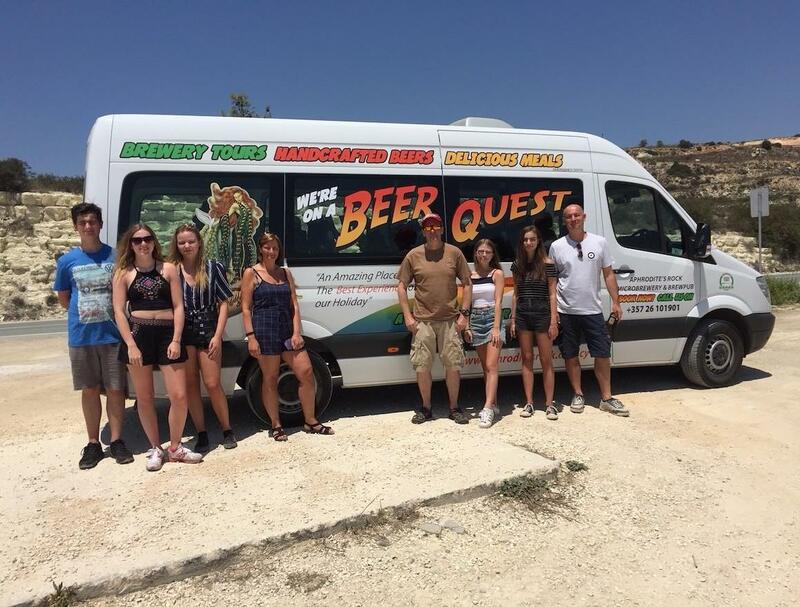 Don't forget us for your wedding in Paphos and as a perfect, safe, venue for the lads’ stag party in Paphos with beer, a brewery, a belly-buster meal and easy door-to-door transport. 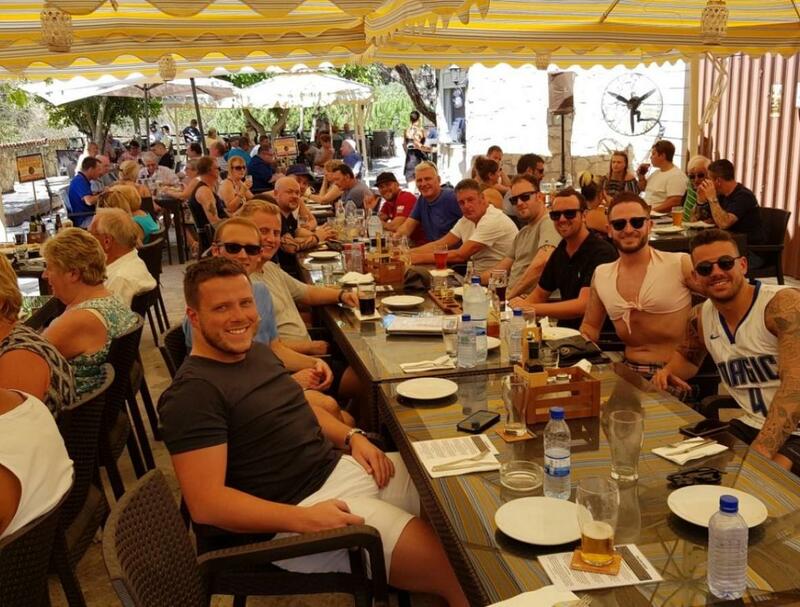 They can sip, sup & slurp their way through our great Cyprus craft beer, real ales & continental lagers or fruity ciders and tuck into the best pizza in Paphos or a mega-Mediterranean BBQ feast for the very best stag party in Paphos. 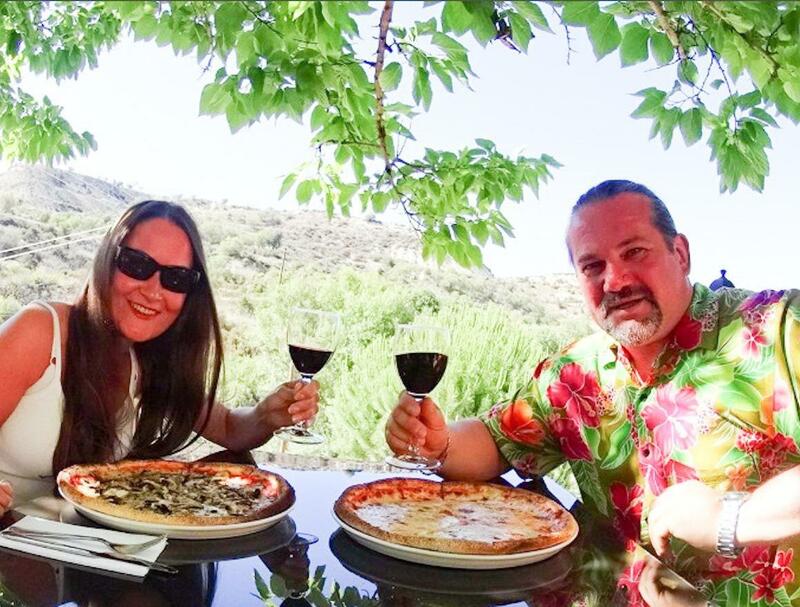 You'll find our lovely former village winery a much less expensive option to outside catering for villa weddings in Paphos. Cyprus taverna cuisine is largely all meat. The best traditional meze in Paphos - Cyprus mezedes - put most people into a 'meat coma' and are full of saturated animal fats and fried in wheat-based batters. For coeliacs in Paphos and vegetarians in Paphos it's a nightmare. It's very hard to find healthy eating meals in Paphos, gluten free meals in Paphos and good vegetarian meals in Paphos. If you want the best vegetarian meals in Paphos or the best vegan meals in Paphos but have meat-eating friends & family with you then come to us. We offer delicious vegetarian meals in Paphos and even our beers are vegetarian & vegan friendly (animal products are in many commercial lagers). Our vegetarian beer is delicious & natural and our cider is gluten-free. We cater for your special needs eg vegetarian in Paphos or gluten free in Paphos. Discover the best vegetarian meals in Paphos and gluten free meals in Paphos.